It can be a bit lonely working on environmental issues from the "right" side of the political spectrum. Environmental academics and activists rarely have much patience (let alone sympathy) for principles that would limit the scope of government power and few conservatives or libertarians take environmental issues seriously. Some of my friends on the right seem to think that any environmental problem the market cannot magically solve must be a hoax. There's no doubt many environmental threats have been exaggerated, and the capacity of traditional regulatory institutions to address environmental concerns is often oversold, but serious environmental problems remain, and they should be addressed. Yet in the political sphere, those on the right either oppose every environmental measure with a reactionary fervor or they insist that whatever we do, we just have to make it cost a bit less. Neither is a satisfactory response. Blind opposition to the Sierra Club's agenda does not an environmental policy make. Nor is there a compelling case for always doing environmental initiatives on the cheap. Across the aisle, unfortunately, concerns for regulatory costs and limitations are viewed with equal suspicion. As illustrated in the past three posts, much of my work explores the possibility and potential of a "pro-environment" policy agenda that is consistent with principles of limited government. This sort of approach is often characterized as "free market environmentalism" or "FME." This moniker may be a bit of a misnomer in that it emphasizes the "market" rather than the underlying set of institutions upon which markets - and sound conservation - both depend, but it certainly communicates the idea of trying to reconcile free enterprise and environmental protection through the recognition and protection of property rights in environmental resources. This approach cuts against the grain of conventional environmental policy. Suggestions for dramatic reform of environmental laws is regularly characterized as "anti-environmental." Part of the problem is the standard fable of federal environmental regulation which recounts an overly romanticized view of the federal government's role in environmental protection. Based on this fable, many believe any effort to curtail federal regulatory authority, expand protection of property rights, or create greater state flexibility is an attack on environmental protection. But it ain't necessarily so. According to the standard fable, post-war environmental conditions got inexorably worse until the nation's environmental consciousness awoke in the 1960s and demanded action. State and local governments were environmental laggards, according to this story, and only the federal government was capable of safeguarding ecological concerns. Events such as the 1969 fire on the Cuyahoga River, memorialized in Time magazine with this picture, are pointed to as support for this traditional account. This fire, which helped spur passage of the 1972 Clean Water Act, is constantly cited as evidence of how bad things were before the federal government got involved. Yet the standard fable is just that, a fable - a fictionalized account with some truth, but fiction nonetheless. Let's start with the 1969 fire. 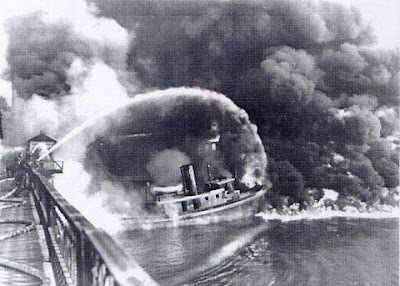 There was a fire on the Cuyahoga River in June 1969, Time magazine did run a photo of a fire on the Cuyahoga, and the story of the fire did help spur passage of the CWA. But that's about where the truth ends. The fire was actually a minor event in Cleveland, largely because river fires on the Cuyahoga had once been common, as they had been on industrialized rivers throughout the United States, throughout the late 19th and early 20th centuries. But river fires were costly and posed serious risks to people and property, prompting local governments and private industry to act. The fire was not evidence of how bad things could get, but a reminder of how bad things had been. None of this means that all federal environmental regulation was unnecessary or unwise. There are some environmental problems that state and local governments are unwilling or unable to address on their own. But, contrary to the standard fable, federal environmental regulation was not always necessary or an improvement over the available alternatives. Among other things it had the effect of dampening innovation and experimentation in environmental protection, encouraging a "one-size-fits-all" approach to some environmental problems that too often becomes "one-size-fits-nobody." And if there is to be renewed experimentation and innovation in environmental policy, there needs to be a recognition that not all environmental policy decisions are best made in Washington, D.C. My own proposal for how to encourage greater environmental innovation can be found here. In my view, greater state flexibility is a necessary, but not sufficient, for meaningful environmental reform. Environmental problems are hard, and the best solutions are not always apparent. Even where there is a broad consensus on the desirability of a particular policy approach, questions of implementation and design remain. Experimentation and innovation are necessary to discover how best to get these details right. I believe that greater reliance on property rights and market institutions will lead to more effective and equitable environmental protection, but until such approaches are tried, the claim is speculative. Only by trying new approaches can we learn which measures best succeed, or fail. I believe property-based approaches will emerge as the best (or least bad) approach to many environmental problems, but we will not know for sure until we try. And unless one is truly satisfied with current approaches to environmental protection (and few are), there is no reason not to let the experiments begin.